Lynch's novel, Grace, was shortlisted for the prestigious prize alongside five other works. IRISH NOVELIST PAUL Lynch is one of six authors shortlisted for the £25,000 Walter Scott Prize for historical fiction. 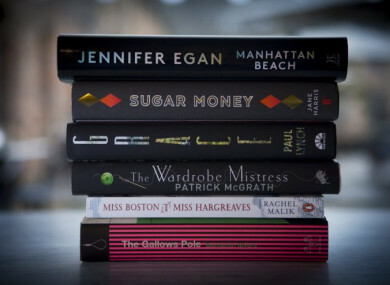 Lynch is shortlisted for his latest and critically acclaimed book, Grace, alongside five other authors: Jennifer Egan, Jane Harris, Paul Lynch, Patrick McGrath, Rachel Malik and Benjamin Myers. Dublin-based author Lynch told TheJournal.ie that he considers himself “very lucky to be on an international shortlist that began with 150 or so books in competition”. Grace, published last year, tells the story of a young girl travelling across 19th-century Ireland on the eve of the Famine. How does one write about the Irish famine and make it new? I think there is still, very deep within the Irish pysche, feelings of shame and anger about that period that makes us look away. It was for this reason that I wanted to write about it, to really explore what it did to us as a nation. What does it mean to survive an event like this? To carry the guilt of being a survivor? Ultimately the book had to become a tale of spiritual regeneration born from our darkest hour. The prize’s judges praised it as a work of “great lyricism”. They wrote: “Its beautiful prose is put to devastating effect in his vivid story of the Irish potato famine which killed at least a million people. From the opening page we travel with fourteen year old Grace as she is sent out from Donegal, seemingly banished by her mother, but actually in a desperate attempt to save her life. It haunted the judges long after the final line. This adds to the critical praise received by the text. In its review, the New York Times Book Review said that the novel “raises timeless questions” while the Washington Post described it as “a moving work of lyrical and at times hallucinatory beauty”. The book was listed on the best books of 2017 lists at the Guardian, Irish Independent, Kirkus and Esquire, and was listed as an editor’s choice by the New York Times Book Review and a staff pick by the Paris Book Review. It has also been shortlisted for the KerryGroup Irish Book of the Year. Lynch told TheJournal.ie today that the spotlight of an awards shortlist can be invaluable in surfacing literary fiction to a wider audience. Born in Limerick in 1977, Lynch grew up in Co Donegal and now lives in Dublin. He previously served as the chief film critic of the now-shut Sunday Tribune. His debut novel, Red Sky in Morning, was published to critical acclaim in 2013, and was a finalist for France’s Prix du Meilleur Livre Étranger (Best Foreign Book Prize) and was an Amazon.com Book of the Month and was featured on NPR’s All Things Considered in the US. With its prize money of £25,000, the Walter Scott Prize for historical fiction is one of the most prestigious literary prizes in the world. It honours Walter Scott, considered the founding father of the historical novel. The 2017 award was won by Irish playwright, novelist and poet Sebastian Barry. Each author shortlisted receives £1,000. The judges said that this year’s shortlist “encompasses the rural and the urban, the exotic and the everyday, the epic and the intimate”. The narrative drive in each of our shortlisted books is compelling, and on the pages are universal truths with which we can identify. A record number of applicants for this year’s Walter Scott Prize were recorded this year, with applicants up 40% on last year, according to organisers. The winner will be announced at the Baillie Gifford Borders Book Festival in Melrose, Scotland, on 16 June. The four-day festival attracted over 31,000 visitors in 2017. Email “Irish author Paul Lynch shortlisted for prestigious Walter Scott Prize”. Feedback on “Irish author Paul Lynch shortlisted for prestigious Walter Scott Prize”.